Ruth Barnett was born and raised in Ohio and her interest in music began at an early age. In grade school she learned to play the piano and the viola.In the eighth grade she also learned to play the trombone and was accepted as a trombone player into the high school marching band and the concert band. Ruth also played the viola in the high school orchestra. After high school, Ruth pursued a nursing course of study and graduated as an LPN from Timken-Mercy Hospital School of Practical Nursing. Her nursing career encompassed many different disciplines including work on hematology research and vision reasearch at Ohio State University Hospital. When the family moved to Massachusetts, Ruth enrolled at Lasell College and completed the course of study to become a Registered Nurse. She worked in the surgical intensive care unit, the step-down surgical unit and the high risk maternity unit. Since retiring and moving to Virginia, Ruth volunteers as the Parish Nurse for the Sydenstricker United Methodist Church. Her duties include checking blood pressure, assisting at health fairs on cancer and diabetes and working with Life Line Screening. She stays connected to her music, having served as the praise and worship learder for the Bethel A.M.E. Church in Boston where she performed at weddings, funerals and organized a voice recital in honor of her Father. Ruth has found time to complete one half of the marathon in New Orleans to benefit AIDS victims. She also is a member of "Curves" and loves to ballroom dance and kick box. Her other intrests include traveling, gardening, working puzzles as well as coloring with crayons. She is married and the mother of two and grandmother of six. 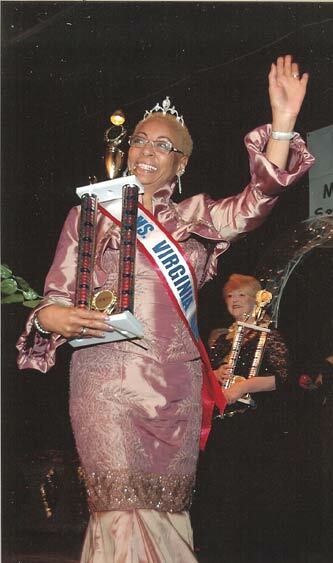 Other winners at the 2008 pageant include: Diane O'Dell Yopp from Christiansburg, 1st Runner-Up and Suzi Athanas from Virginia Beach was declared 2nd Runner-Up. The Community Service Award was presented to Betty Mann for the 5 years she has spent entertaining in Nursing Homes and Assisted Living Facilities on a weekly basis in the Richmond area. 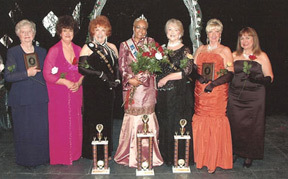 The Miss Congeniality title was awarded to Bessie Saunders, a life long resident of Annandale. 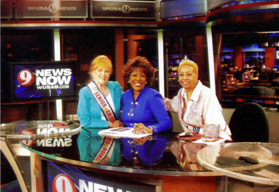 One of Washington's most respected and durable broadcast journalists, JC Hayward interviewed Pinky O'Neil (MVS Queen 1996) & Ruth Barnett (MVS Queen 2008) on Channel 9 noon news.